Machine learning: things are getting intense – In 2018, the number of machine learning technology implementations and pilot projects by medium and large-sized enterprises will double compared with 2017, and double again by 2020. Hitting the accelerator: the next generation of machine-learning chips – By the end of 2018, over 25 percent of all chips used to accelerate machine learning in the data centre will be FPGAs and ASICs. The new semiconductor chips, in addition to GPU chips that were the main choice in the past, will increase the use of machine learning and enable applications to use less power, yet still be more responsive, flexible and capable. Mobile only wireless home internet – Twenty-five percent of Canadians with internet will get all of their internet data access via cellular mobile networks in 2018. Is there an #adlergic epidemic? Adblocking across media – Seventy-four per cent of Canadians engage in at least one form of regular adblocking, but only about six percent block four or more ads – the “adlergic” population. Individuals who are young, highly educated, employed, and earn higher incomes are more likely to be heavy adblockers. Live thrives in an online world – Live broadcast and events will generate over US$545 billion in direct revenues in 2018 globally and C$17.5 billion in Canada. Despite consumers’ capability to consume content on demand or attend events remotely, live consumption is thriving and can be made more productive and profitable by digital. Smartphones are useful, but they can be distracting – By the end of 2023, more than 90 percent of Canadian adults will have a smartphone, with ownership among 55-75 year-olds reaching 85 percent. Owners will interact with their phones on average 65 times per day in 2023, a 20 percent increase on 2018. However, 39 percent of Canadian adult smartphone users and 65 percent of 18-24 year olds will worry that they use their phones too much for certain activities and will try to limit their usage in 2018. Digital media: well worth paying for – By 2020, there will be over 680 million digital subscriptions, with consumers increasingly willing to pay for content. Augmented reality on the cusp of reality – Over a billion smartphone users will create augmented reality (AR) content at least once in 2018, with at least 300 million doing so monthly, and tens of millions weekly. This translates to about 15 million Canadians using AR. The future of the smartphone: the era of invisible innovation – Smartphone sales will reach 1.85 billion units per year by 2023, equivalent to over five million units sold per day. The smartphone’s success over the next five years is likely to be the introduction of innovations that are largely invisible to its users. 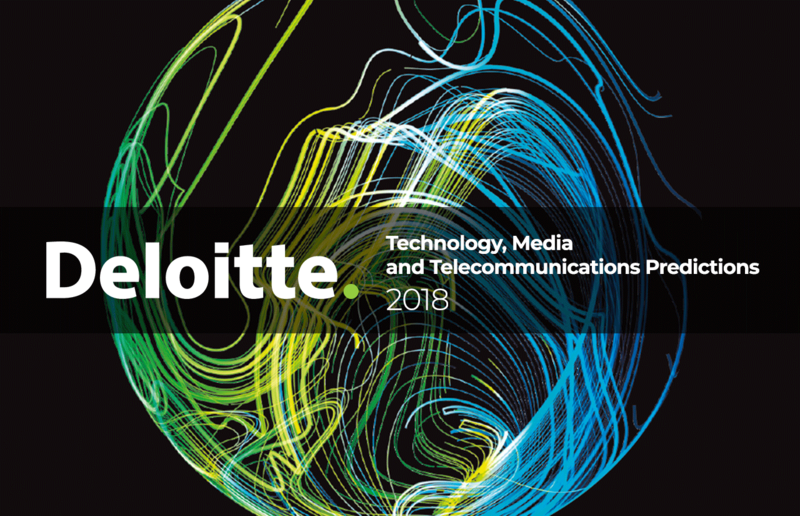 TV viewing by 18-24 year olds: stable declines, but no tipping point – Deloitte predicts that traditional TV viewing by 18-24 year-olds will decline by about 10 percent per year in Canada in 2018 and 2019. This rate of decline is a similar rate to the prior seven years and is not getting worse. Many forces that distracted young people away from traditional TV, such as smartphones, social media, and video piracy, are reaching saturation. In-flight connectivity takes off – One billion passenger journeys, or one-quarter of all passengers, will be on planes fitted with in-flight connectivity (IFC) in 2018, an estimated 20 percent increase from projected 2017 totals, generating IFC revenue close to US$1 billion for 2018.